On the night before final exams, all current Maryville College students are invited to Pearsons Hall for Finals Breakfast – a late-night breakfast, served by faculty and staff. The event offers a much-needed study break and an opportunity to gather one last time with friends before leaving campus at the end of the semester. While many other colleges and universities host Finals Breakfast events, junior Natalie Tankersly ’20 thinks Maryville College’s tradition is special. This semester’s Finals Breakfast event is Dec. 6, and like past events, it will include a group of dedicated faculty and staff members who will dish up breakfast favorites, such as pancakes, waffles, eggs, bacon and biscuits. 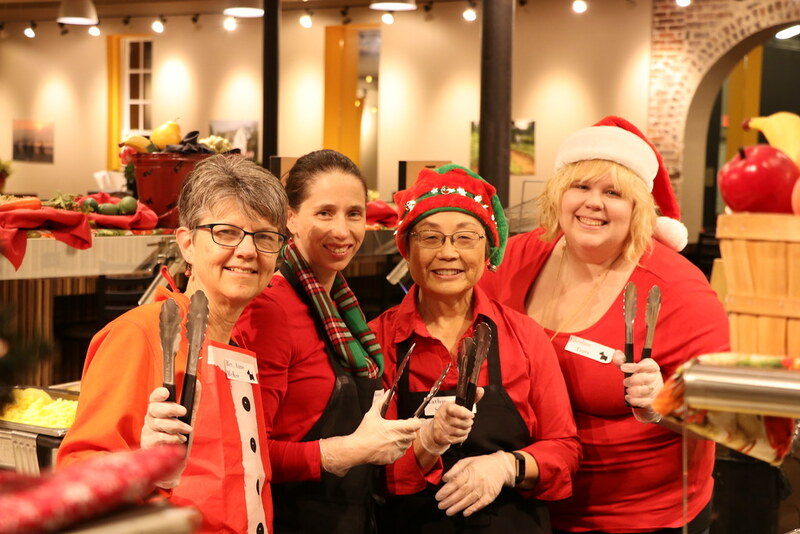 For the fall event, many volunteers wear festive holiday sweaters and hats. Dr. Dan Ross, associate professor of mathematics, has participated in every Finals Breakfast event since he arrived on campus in fall 2010. “That’s 16 breakfasts, and about 2,000 biscuits served,” he said, adding that while he’s served a lot of biscuits, he has done other jobs during the event, including serving waffles, French Toast sticks, grits, eggs, sausages, bacon and orange juice. “I always enjoying being with our incredible students outside the classroom,” Ross said. “It can be a stressful time of the semester for everyone, so it’s great to have a little time to relax and enjoy food and fellowship as a break from everything. It’s fun to greet the students and offer them some good food. I also enjoy having a good time with my fellow faculty and staff colleagues. I think it’s a great tradition, and I hope all of our students come out so I can serve them a nice hot biscuit with some gravy! “I am proud to be serving again (this semester) … I can’t resist foods dripping with maple syrup,” Ross added. Adrienne Schwarte, chair of the Division of Fine Arts and associate professor of art, has also volunteered for Finals Breakfast events at MC. “What I enjoy about this event is that students work so hard all semester, and finals times can be quite stressful, so I enjoy switching roles – instead of being in front of the classroom, I get to serve the students and provide them a little fuel before exams,” she said. Schwarte remembers her undergraduate institution doing a similar tradition, and as a student, she always looked forward to seeing her professors laugh, smile and wish her good luck on exams. “And who doesn’t love bacon at 10 p.m., right?” she asked. Dr. Carl Gombert, MC professor of art, has been volunteering for the event for at least 15 years. He recalls taking coffee around on a tray and serving it to students in the dining room. He felt “honored” to be promoted to waffle maker after former MC Technical Director Alan Reihl retired. It is unknown exactly when the tradition began at Maryville College, but many agree that it was likely in the early 2000s. Michelle Ballew Safewright, former associate dean of campus life at Maryville College, served 16 years in MC’s Student Affairs Division and fondly remembers volunteering at the event. She said that initially, Student Affairs staff members were the ones who served breakfast, but when former Vice President and Dean of Students Vandy Kemp assumed her role in 2004, she opened it up to faculty and staff and encouraged involvement from around the campus (“best idea ever,” according to Safewright). MC alumnus Jordan McCullough ’18, who also works in Maryville College’s Office of Admissions as an admissions counselor, attended most Finals Breakfast events as a student at MC – and he had a strategy. He recalls “the mix of happiness and dread” he felt during each Finals Breakfast he attended as a student. Above all, McCullough enjoyed the tradition for the great memories that it brought. In preparation for the College's Bicentennial celebration in 2019, this story is part of "Maryville Moments," a monthly feature that highlights special traditions at Maryville College. Stay tuned for next month's feature! On the night before final exams, all current Maryville College students are invited to Pearsons Hall for Finals Breakfast – a late-night breakfast, served by faculty and staff.